Advocates are pleading Obama to suspend the deportations of those who would gain status under a new immigration bill. Congress has a long road ahead on immigration reform. The Senate Judiciary Committee has started to consider some 300 amendments challenging the nearly 900-page bill crafted by the Gang of Eight. Lawmakers are hopeful that legislation will pass both houses by the end of summer. But from now until then, the detention and deportation of undocumented immigrants may continue full force. A group of advocates is now making a renewed call on President Obama to suspend deportations of those people who would gain status in the bill’s final version later this year. Senator Chuck Grassley filed seventy-seven amendments to the bill—more than any other legislator—amid suggestions that hundreds of amendments will make the bill insurmountable in committee. The bill already includes a potentially problematic trigger that stipulates that no undocumented immigrant will be eligible to apply for provisional status until there’s a certain measure of border security. Grassley submitted an amendment to require the southern border be secure for six months before the application process began. Senator John Cornyn argued that migrants “wearing some form of turban” were regularly crossing at the southern border—indicating not only some lawmakers’ anxiety about the presence of people of certain perceived religions and ethnicities but also the profound confusion about the kinds of people that migrate north seeking work. The amendment was ultimately defeated, but demonstrates the will on the part of some lawmakers to drag out the legalization process as long as possible. As legislators hammer away at what the final proposal will look like, the current bipartisan bill already defines those people who will qualify to remain in the United States once a bill is signed. Advocates are now calling on Obama to issue an executive order to stop ongoing deportations of those who would be eligible under a new bill. The detention and deportation of undocumented immigrants often gets lost in numbers, rather than highlighted as individual stories—and some advocates say that’s part of the problem. Pablo Alvarado, who heads the National Day Laborer Organizing Network (NDLON) says that when immigration is debated at the Capital, it gets divorced from what’s happening to communities on the ground. 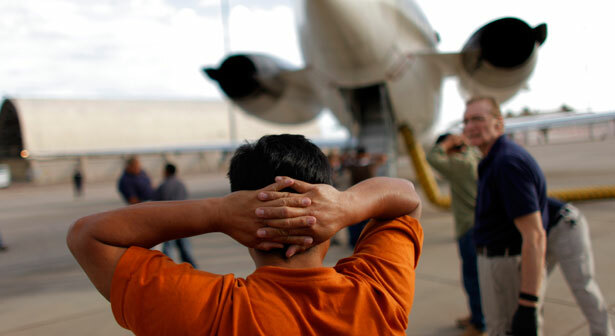 “Suspended deportations would ground the debate in reality,” says Alvarado. That reality is typified by people like Carmen Yvette Martinez, who was driving with her husband Roger Tabora Martinez in Boston in February when they were pulled over. The police officer informed them that he believed there was a warrant on the car. When Carmen—who is a US citizen—tried to explain that the car was in her name and there was no warrant, the officer asked both husband and wife to show proof of identification, and began to inquire about their immigration status. Upon learning Roger was undocumented, the officer took him in to custody. Although he has a clean criminal record and helps support his wife and stepson, Roger was held in immigrant detention for nearly three months before being deported to Honduras last week because of an immigration order stemming from nearly a decade ago. Yvette and Roger’s story is one of twenty-five featured on a website tracking deportation cases, started just about one month ago. Fourteen cases are ongoing; seven have resulted in a stay and four have resulted in deportation. NDLON, along with the AFL-CIO, MALDEF and United We Dream, is also asking people who represent organizations invested in immigration reform to sign a petition on the site to urge Obama to suspend the deportations. Obama met with representatives from more than a dozen progressive unions and business leaders in February, and declined a similar request to halt deportations at that time. Advocates point out that this time is different, because the bipartisan Gang of Eight has moved forward, and the move to suspend deportations would work around the current proposal. In February, Obama stated that he didn’t want to start a controversy that could derail the bill in Congress. But by his not heeding the voices of the families whose loved ones have been removed, the controversy of record high deportations continues. Take Action: Halt Deportations Now!